Washington is trying to pull New Delhi away from BRICS and into being a proponent of American interests in Asia. In early August, all of a sudden three senior American officials, within short intervals, visited India – Secretary of State John Kerry, Secretary of Commerce Penny Pritzker and Defense Secretary Chuck Hagel. There are many reasons for such attention being given to India, but most important – it is a desire to turn India not just into a partner, but also an ally and proponent of American interests in Asia and possibly wrest it out of the BRICS – a union of countries that in the medium term will be able to break the monopoly of the United States in the world economy and politics. Most commentators, assessing the results of the visit, are focusing on the short-term aspects. Thus, no one is silent on the topic related to the fact that, until recently, the current Prime Minister of India Narendra Modi was considered a persona non grata in the United States, and the State Department had denied him an entry visa. Now the situation has changed, and Washington has an urgent need to “save face” – to deny a visa to the leader of one of the world’s leading powers is simply inappropriate. 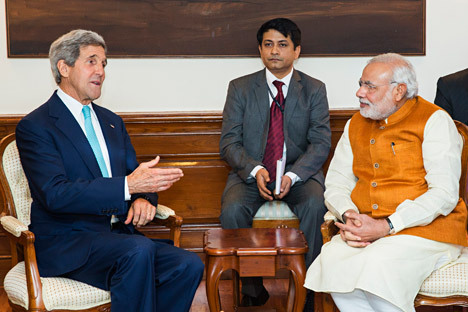 John Kerry, during his visit, was forced to announce that are no longer any visa problems, and the United States eagerly awaits the arrival of Modi. The visit will take place in September, when Modi will attend the UN General Assembly session, and within the framework of the visit, he will meet with President Barack Obama. There are other aspects of bilateral relations – including a number of still unresolved issues. Thus, Secretary of State Kerry and the Secretary of Commerce Pritzker failed to make India change its positions, after being lobbied by the United States, on the draft agreement in the WTO on the easing of trade rules (Trade Facilitation Agreement). India believes that this agreement would force it to cancel the country’s agricultural production subsidies program and thus negatively affect 67 percent of the population – namely, the poorest and most socially vulnerable layers. The American emissaries also did not succeed in making amends for the negative feelings caused by the recently revealed facts about American spying on the leaders of the Bharatiya Janata Party in India. Other problems also remain – for example, the tightening of immigration laws in the United States and the, currently being discussed in the Senate, measures to discriminate against Indian IT companies (the so-called Bill 744). However, these problems, despite their severity – are but a reflection of a global set of issues related to currently occurring processes on rebuilding the entire system of international relations. The unipolar world that the United States was building during the 1990s, and which was still maintained in the first decade of the 21st century, is bursting at the seams. Washington of course understands this – and hence the frantic and clumsy attempts to change the course of things. It is this desire to preserve a unipolar world order that has led to the stubborn refusal of the United States to admit their defeat in the Greater Middle East. This same striving underlies the current crisis in Ukraine, initiated by the United States in order to achieve several strategic objectives – to drive a wedge in relations between Russia and the European Union, grab a larger share of the European gas market, and in case events developed in the most unfavourable scenario for the world (and beneficial for the U.S.) – the multi-trillion write off of foreign debts. A big war would write them all off. One wonders, why is India needed here? In fact, in today’s globalized world, events in different parts of the world cannot be seen in isolation. Failures of American foreign policy and the increasing complexity of the economy have led to the fact that Washington simply does not have the resources to realize the declared in late 2011 “Year of Strategic Pivot to Asia”. Meanwhile, China – the main geopolitical rival of the United States – is not only growing in economic power, but also political influence. Therefore, the main strategic goal of Washington in Asia and the Asia-Pacific Region has become the shifting of the burden of confrontation with China on regional powers, primarily Japan and India. However, the government of Narendra Modi, in the first steps it took in the international arena, has demonstrated that India’s focus will be on the development of good relations with its neighbours in the region, including with China. Evidence of this became especially evident in Modi’s participation in the highly successful BRICS Summit in Brazil, and next week’s trip of Chinese President Xi Jinping to Delhi. It is this fact that the Obama administration is highly reluctant to admit. The fact that the crisis of the unipolar world order is being manifested not only in the permanent foreign policy failures of the United States, but – which is much more dangerous to Washington – in the long term, the dollar will lose its monopoly position in the global financial system. Against this background, the BRICS initiative on the creation of the Development Bank, in which the calculations will be made in local currencies, poses – if not instantly, but in the long term – a huge threat to the monopoly of the United States and international financial institutions established under the Bretton Woods system. Yes, for now the BRICS countries, even in the aggregate, in terms of the size of their economies, are inferior to the USA, but these are the ones, as well as other developing countries, which in the future may join this association, account for the main growth of the world economy. Moreover in the future, in two or three decades, that which today still looks like a timid sprout, is capable of growing into a mighty tree. This explains the increased activity of the United States in the “Indian Direction.” Now it seems that for Washington, the most important task is to drive a wedge between the BRICS countries. This explains the policy of imposing sanctions against Russia, and the desire to represent Russia in the role of the “aggressor”, and in the not very clear, but unambiguous, threats against China, and attempts to flirt with India. If Washington succeeds in pulling out at least one “Eurasian” link from the large BRICS association, then a tombstone will be placed on the entire association, which may allow the United States to keep the inertia (or illusion) of a unipolar world for a few more years. Therefore, attempts to flirt with India should not be taken as a sincere desire for mutually beneficial cooperation. In all of its foreign policy actions, the United States has always pursued only its own interests. Thus, if at this stage those interests make it necessary to establish relations with a particular country, it does not mean that after a while the United States will not make a turn in the opposite direction.